The Zodiac Sign Gemini Man (May 22 - June 21), Gemini Personality Traits for Male born under May Zodiac signs. With a first glance on a Gemini man, one gets the impression of a genius - he can speak perfectly on any topic, plan and dream, talk about his victories and conquests. But it should not be forgotten that Gemini is a zodiac sign with two unknowns, both of which tend to draw attention to themselves. He easily plans and just as easily, parts with his plans in favor of other more valuable ones, and he at that would not budge at all. Gemini man willingly communicates and sometimes unbearably chatty, especially in moments of stress or anxiety. One can never be sure in this person because he himself does not know where his desires and thoughts in the next minute will lead to. It is not for nothing that the zodiac sign is called dual since Gemini man can vary, depending on the situation, and often these changes occur in the opposite diameter direction. This man loves the society. Without communication, he becomes sluggish and sick. His passion - to communicate widely - at first attracts women to him, but later, can be a cause of jealousy and many quarrels in the family life, because the Gemini man will always be focused on society more than on his family. This representative of the zodiacal circle has a great taste, he always tries to look elegant and well. He is able to scatter compliments to all around, others listen to his comments, because they are truthful and witty. Gemini man's intelligence is undeniable, he can acquire an excellent education and always strives to supplement it, but if his life turned out in such a way that he had not received higher education, he has deep knowledge in many areas of science and life. Gemini man is always full of great ideas and plans, but he should not be believed on words, or looked forward for him implementing these plans because he changes like a weathercock. He is always unpredictable, it is impossible to accurately predict his future actions and therefore life with Gemini man is sometimes simply unbearable for a woman. From birth, this partner already is an active non-conformist - he does not accept rules and conditions that are accepted in society, he has his own views on the norms and rules by which he lives, but that may be unacceptable to others. The Gemini man can easily break up with old friends for new ones, just as he could easily part ways with his loved one for a new hobby. But this person cannot be considered a heartless man much less a traitor - his very quickly changing personality calls him for himself, to new experiences, and in every moment of his life, Gemini man looks for a perfect option that meets these his internal changes. It is not easy to love a Gemini man, but relationship with him may be of interest to every woman. His change still makes sense because he always tries to be better than he is at the moment. In relations with his partner, Gemini man in the society may be clearly cold and even rude, but only a very sensitive woman who understands his subtle nature, knows that beneath this feigned rudeness of her partner lies a subtle, delicate and vulnerable soul. The partner does not need to take close to heart what he does and how he acts. With Gemini individuals, one needs to adhere to a very important and necessary rule - do not approach him closely, remain a mystery and secrecy for him, which he would want to reveal himself. Gemini man should not be bothered, he cannot be commanded, or imposed with your opinion, otherwise he will consider this as an attack on his personal freedom and will try to escape from the relationship. Gemini man should be left with the right to be independent, and then he would never leave his beloved woman, and will eventually become more and more consistent and open with her. 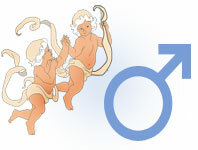 The signs of Zodiac personal characteristic with gender orientation. What is your Zodiac sign meaning, how the fact you were born under particular Zodiac Sign may affect on your personality. Full description of Gemini Man, character traits and personality characteristic for male Gemini. You should pay more heed to your heart and less to the impression you are making. Try not to lose yourself in your work today. You should beware of those who would take an advantage of your good nature. Spending time with loved ones or mounting a hobby will bring favorable results. Don’t be afraid to let others see into your inner life- avoid adopting a double standard concerning observation and privacy. You should put off all affairs and take some time to help this person. Don’t try to impose your ideas too forcefully. Try to be more accepting and less touchy today. Don’t cut yourself off from line. Try to be more selective in your interests today. Love is today's motto ! Try not to be too defensive today. A sparrow in the hand is better than a pigeon on the roof.